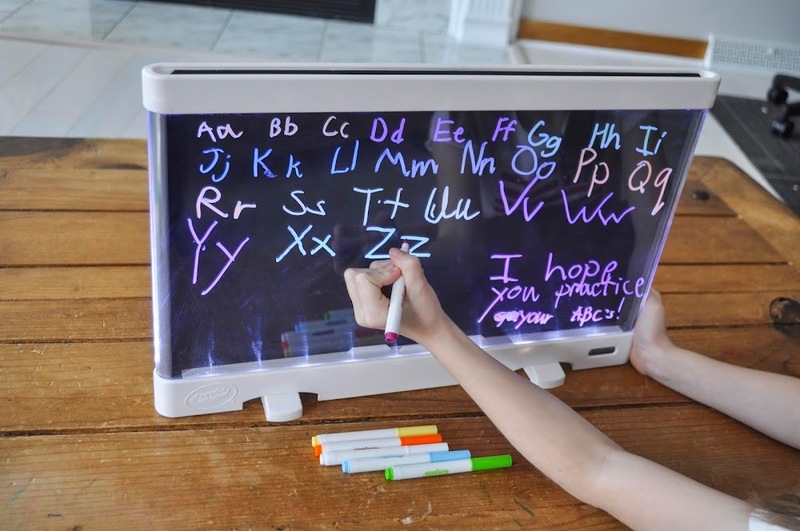 My kids were super excited when crayola sent us the Crayola Ultimate Light board in exchange for an honest review. My kids begged and begged to play with it after we got it. 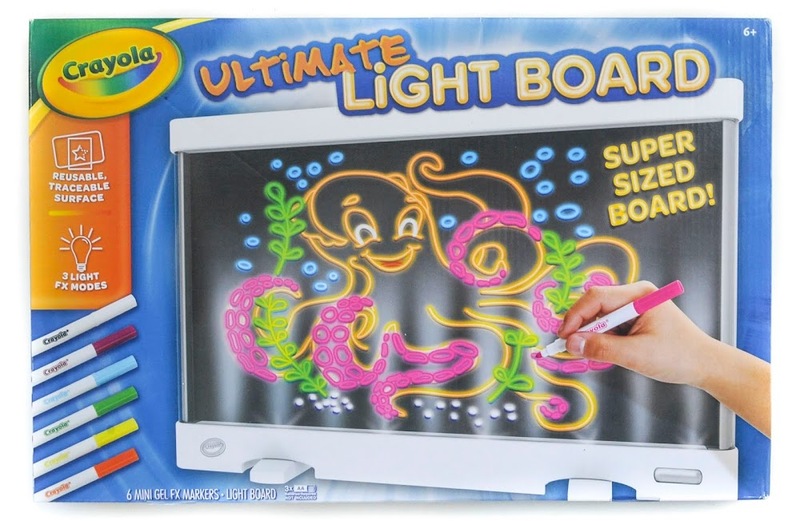 This is the 3rd light board we have from Crayola and one of our favorites, they are all really. They are each every different. 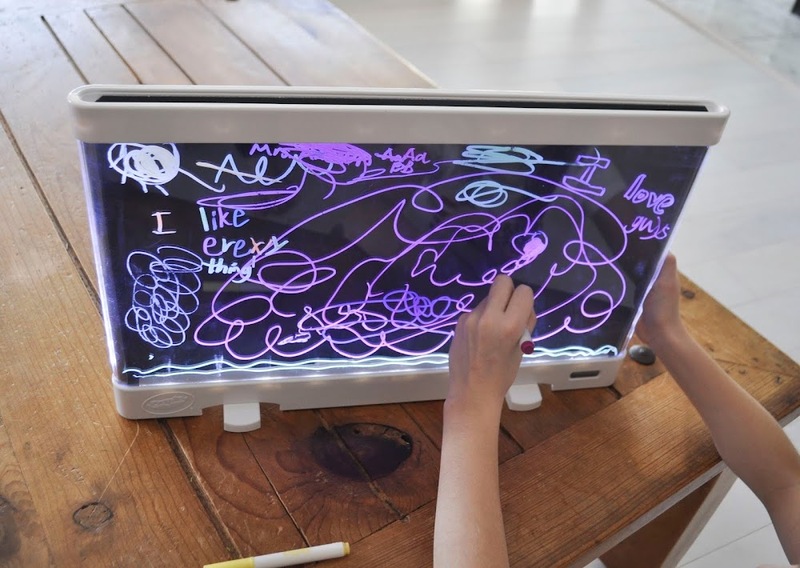 We also have the Star Wars light up tracing pad and a dry erase crayon light up board. I have not posted about those yet, but will soon. This board is by far the biggest and seems to have used the best technology from the other boards. There are 6 mini gel fx markers and one light board. The light board takes 3 AA batteries which are not included. 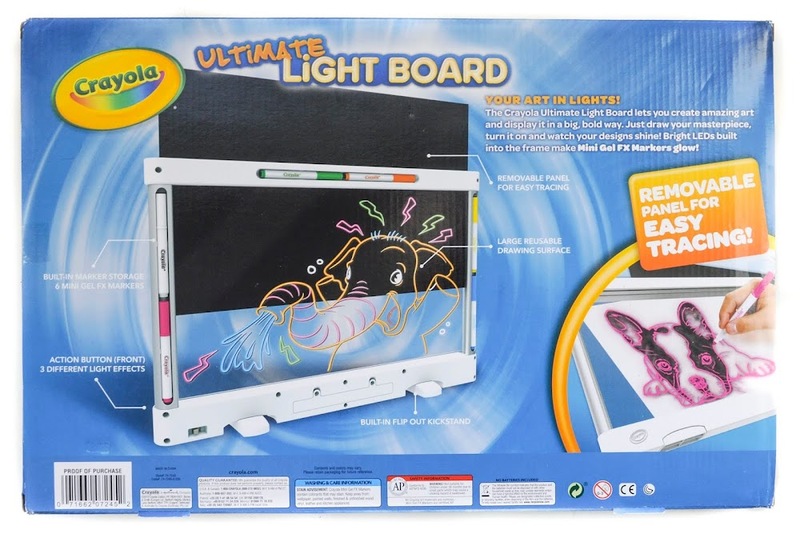 The Crayola Ultimate light board has lights on the inside that "light" up and glow especially in the dark. It is specifically designed only to work with gel fx markers. When the markers are first used they go on dark and then lighten up because of the technology in the fx markers. The board can also be sued as a tracing board when the panel on the front is removed. The paper to be traced is put on the back of the board and can be traced when the board is turned on. This board is also nice because it has a kickstand to stand up. I will note that the batteries should be removed before and after use. I have made the mistake of leaving batteries inside a game and they ruined it. The button on the front side can be used for different light effects; standard on, blinking lights about 1 second apart, and gradual lights. To remove the marker from the board we used a wet washcloth. There was a bit of a streak left. I feel like if I used window cleaner it would have been streak free. The streaks were okay with my kids, they did not complain or even seem to notice. My kids had fun playing with the board for hours. It can be used in daylight and in the dark. 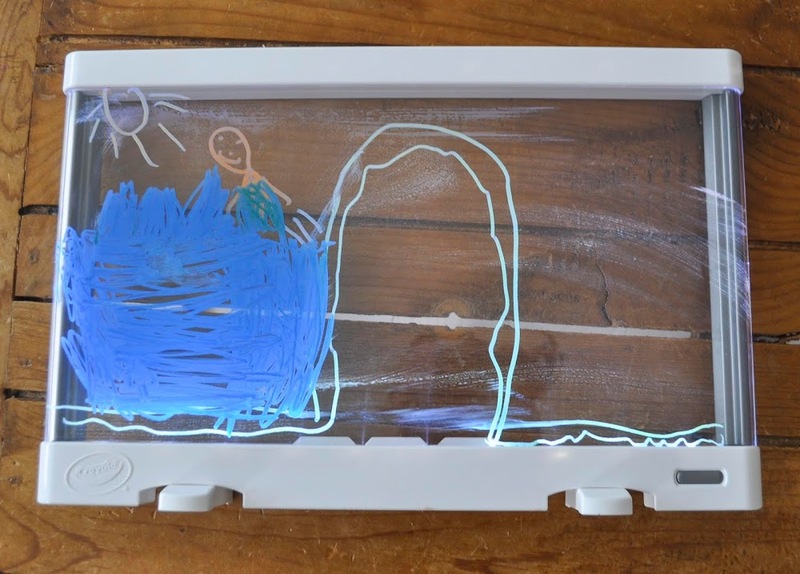 My daughter and son loved doodling on the board. I also had my daughter practice her upper/lower case letters, and numbers. She left little messages on the board because she knows I put them on the website now, "get good" and "I hope you practice your ABC's". 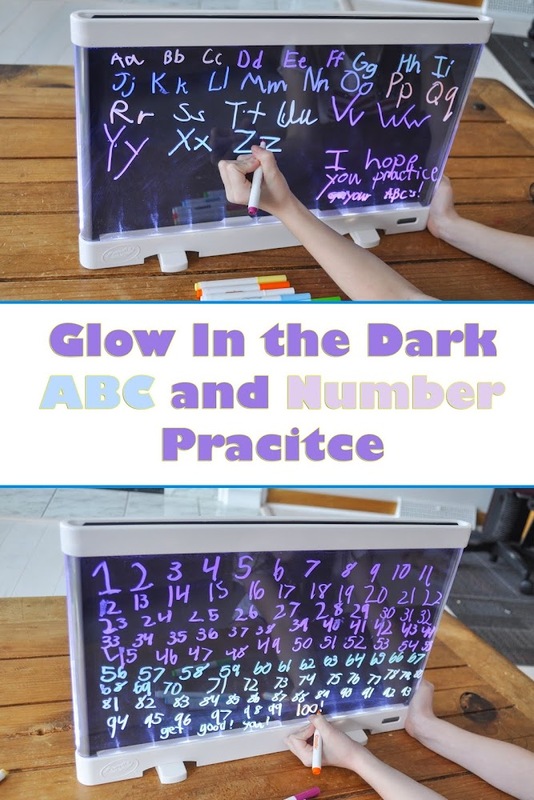 This board would be great to use in a classroom setting for students to practice their letters and numbers, play games, or a general reward for the day. The black part of the board can also be removed for tracing or a different effect. 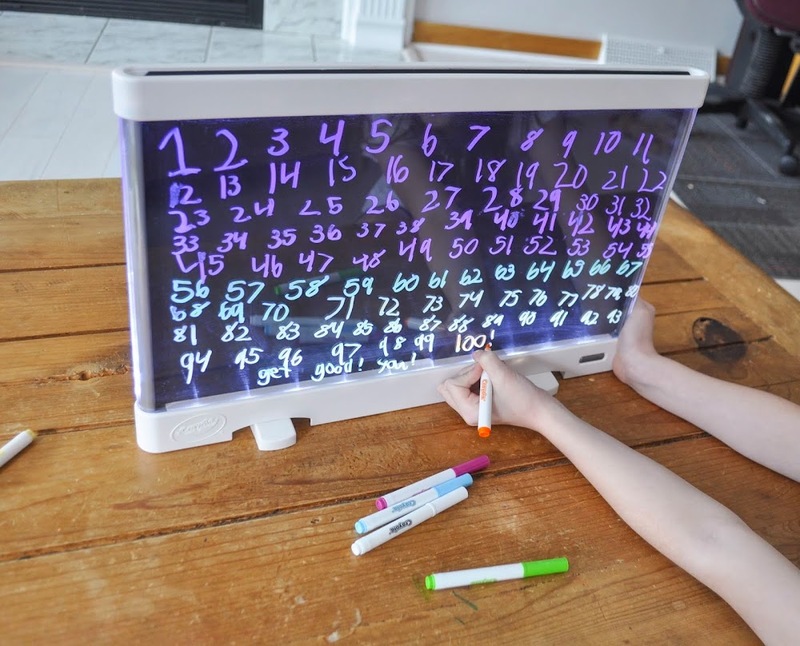 My kids loved the board and would not change anything. They have already filled the board up with more doodles. The board is also very reflective from the pictures above. It was tricky to get a shot of the board by itself. It did not effect the use of the board. My kids still loved it. Where to buy: crayola.com or any places that sells Crayola products.